The AWG5000B Series of Arbitrary Waveform Generators delivers the optimal combination of industry leading sample rate, vertical resolution, signal fidelity and waveform memory length, all in an easy to use self contained package. 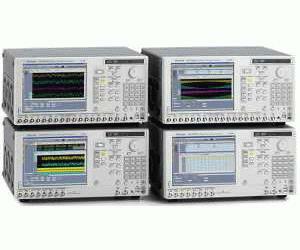 The series offers the industry s best solution to the challenging signal stimulus issues faced by designers verifying, characterizing and debugging sophisticated electronic designs. Meeting the needs of today s design engineers, the series provides excellent signal dynamic range and integrity. AWG5000B Series models, with a 14 bits DA converter based sample rate from 600 MS/s to 1.2 GS/s, 2 to 4 output channels, synchronized 4 to 8 digital marker outputs, and 28-channels of digital data outputs, easily solve the toughest measurement challenges in wireless base band I/Q communications, digital consumer product design such as imaging devices, data conversion equipment and semiconductor design and test. The open windows (Windows XP) based instruments are easy and convenient to use and connect easily with peripherals and third party software.